Which heart rate monitor with GPS should I buy? After going a few years without training with a heart rate monitor with GPS, I’ve decided that it’s time to look into getting a new one. I still own a Garmin Forerunner 310XT that I hope to never use again because it’s been fairly terrible. I used my Forerunner primarily for running, but did some cycling with it as well. It was probably an 80%/20% split. I originally chose the 310XT because of its long battery life, and of course, for its heart rate and GPS features. I had previously run with an old Polar, maybe a S625X? 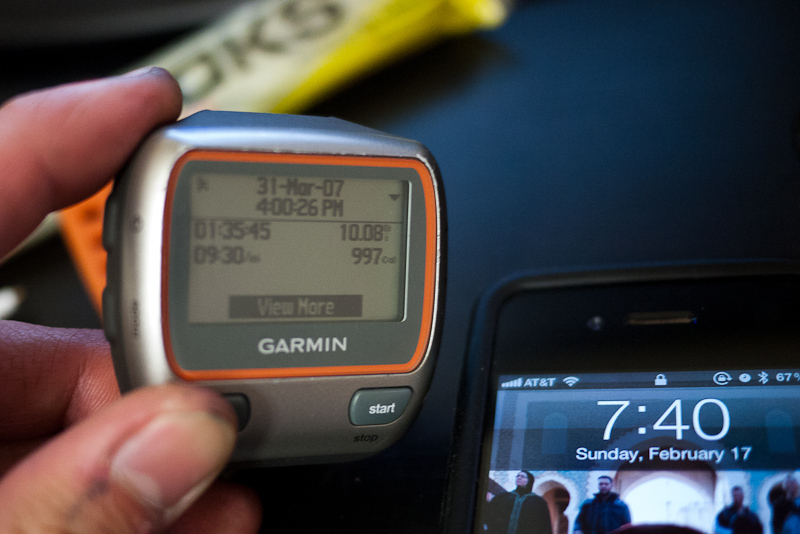 It worked pretty well, but I was intrigued by the idea of using GPS to track my workouts. In theory, based on the features, the 310XT was a cool product, but in practice, it was burdened by awfully buggy firmware that made it unusable most of the time. I’ve had such a profoundly bad experience with that watch, that I’d rather not buy another Garmin device again. Non-creepy data storage. I’d like to not have to rely on a company’s website to look at my information, and I’d like to choose whether that information is private or not. Battery life: 8 hours would be great, so that I could use it on longer bike rides. Waterproof, because I sweat a lot. I don’t really swim, but riding and running in rain happens not too infrequently. So, what’s out there now? I bought the 310XT in early 2012, and the Polar many years before that. Things have changed a lot, and there are new players in the game. My iPhone has GPS built in, and if I want heart rate data, I can get a “dumber” device that measures my heart rate and have it sync with my phone. I usually don’t run with my phone, though, and on longer bike rides, I’m concerned about battery life. So I’d prefer to look for something different. Fitbit has a wide range of devices available now. On the higher-end is the Charge HR and the Surge. The Charge HR is their “Active Fitness” device, and the Surge is their “Performance fitness” device. The Charge HR will track steps and heart rate, but has no GPS. The new Blaze just came out too. It has a heart rate monitor, but does not have an embedded GPS. One nice thing about the Fitbit devices is that they can measure heart rate without the chest strap – a sensor is part of the wrist band. One can use any of their devices, or none at all with their app’s “MobileRun” Feature. I’m not going to buy a Garmin, but I still am interested in knowing what their product offering looks like. Their vivofit line includes 3 models of interest. The Vivosmart HR contains a heart rate monitor that measures from your wrist. It does not contain a GPS. The vivofit vivoactive does contain a GPS, but has no heart rate monitor. The vivofit vivovactive HR has both, and would probably be the device I’d consider if I were considering Garmin at all. Garmin also offers a fenix series. Only the fenix 3 HR contains a heart rate monitor and a GPS receiver. All of the other fenix models (fenix 2, fenix 3, fenix 3 sapphire) have various levels of GPS functionality, but do not have a wrist-based heart rate monitor. Suunto wasn’t ever high up on my list, but I wanted to see what they have to offer. Browsing their website, I found three models that may fit my criteria. The Traverse, the Ambit3 Vertical and the Ambit3 Peak. The unit turns on by itself while connected to the computer. Sometimes while it is charging, I’ll hear a loud buzzing near the computer and check the unit. It’ll be on and trying to get a GPS signal. Even when the computer is off, and the unit is still connected via USB, the 310XT will turn itself on. By the time I use the 310XT, the battery is dead. This has happened many times to me. Getting a GPS signal takes a long time. It usually takes the unit about 30 seconds to start up. This seems really slow. But after that, sometimes it will take perhaps 2 minutes just to find a GPS signal. I can’t turn the unit on ahead of time to get around this as there generally is not GPS reception indoors. Sometimes, the unit takes about 10 minutes to boot. The 310XT gets stuck on its boot screen where it displays the Garmin logo. This happens about 5-10% of the time. I try to wait for a few minutes in hopes that the unit will boot but usually start my run with the unit still stuck on its boot screen. After an additional 5 to 10 minutes or so, the unit finally boots and works normally. Update: This happened again, two times in a row. I estimate that it took about 15 minutes to boot up and work normally each time.. which made it pretty useless for my runs. Unless I un-pair and re-pair my device, data won’t be transferred from the 310XT to my computer. Even when I do this, sometimes I can’t transfer data. The .FIT and .TCX files are downloaded to my PC, but they don’t go into Training Center. I eventually tried resetting the 310XT to fix the problem. I was able to transfer data well for about a month. Then, the same problem started happening again – the 310XT would transfer data to my computer but I could not get the data into Garmin Training Center. I tried re-pairing multiple times but had no success. I think I’ve made some progress in figuring out why this doesn’t work. It seems that one of the XML files, GarminDevice.XML is not correct. I tried copying another version that exists on my PC over, and the data transfer started to work as soon as I restarted ANT Agent. I’ll update this as I make more progress. While I was having trouble transferring data, I decided to take a look at my Activities History on the watch. According to my watch, all of my runs in the last 3 weeks happened “Yesterday”, each 2 minutes apart. I turned the watch off, and turned it back on. The date of the Activities changed to March 31st, 2007. I suspected that the date was wrong because the GPS gets its time/date information from the GPS satellites, but the unit showed good satellite signal with 24 ft accuracy. Also, the time the GPS unit displayed was correct. This isn’t as big of a problem, but apparently humid air can enter the unit and condense on the inside of the screen. This usually goes away after a few minutes. I don’t remember if this happened before, but usually the screen displays a charging status indicator (64%, for example) when it is charging. I came back to check on the 310XT’s charging status and the screen was completely blank. I have no idea if it is actually charging or not, or if the unit has crashed. To turn it on again, I had to do some combination of removing it from the charger, hitting the power button, then placing it back in the charger. I ran a half marathon, and when I tried to transfer the data to my PC, I ran into all of the problems I’ve mentioned. Somehow all of the connecting and disconnecting from the charger caused the 310XT to 1) delete my half marathon from record 2) reassign the date of all of my other activities to today. This is intensely frustrating, as I wanted to see my splits and my heart rate from the race. I noticed that in addition, my setup for the screens (to display heart rate, pace, total time, etc) had been reset to the default. Argh. I can’t send courses to the device, and Garmin Express doesn’t even work. Definitely not. It has a lot of potential, and I like the idea of being able to track my activities and heart rate, but there are too many problems and glitches and headaches associated with using the 310XT. It’s buggy and has a lot of quirks that make it feel like an unfinished beta product. The funny thing about the bugginess of the 310XT is that it’s still for sale on Garmin’s website as of March 2014. They haven’t updated its firmware since July, 2012. I find it kind of shocking that they haven’t put effort into fixing the issues I’ve experienced, and I don’t have a lot of confidence that Garmin will ever fix them, since it’s been nearly 2 years since they’ve touched the firmware of the product. This makes me a little uncomfortable when considering purchasing their other products as well. Please leave a comment with your experiences. I haven’t found anything similar online.